PACIFICO BUNS & BOWLS is the new food venture from the folks behind Parker Bowles and Prince Charles. 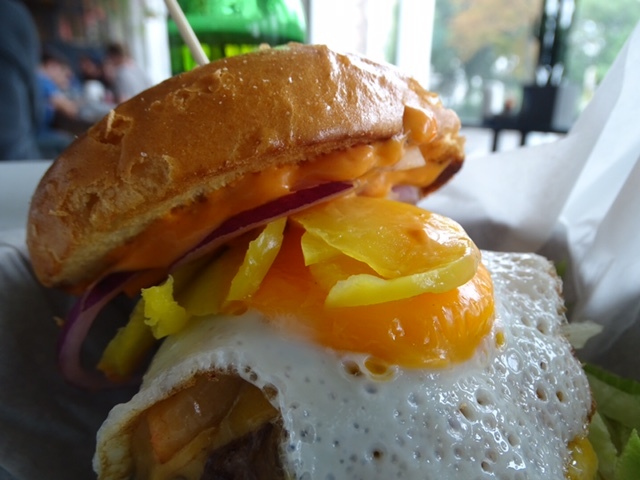 As the name suggests, this cool and casual lunch spot offers a fun fusion of dishes and flavor profiles from the Pacific region. 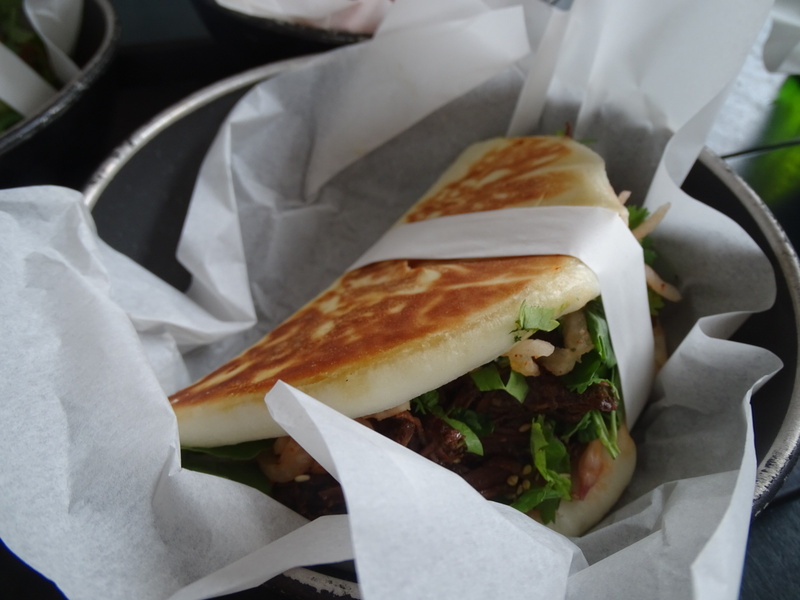 There is, however a notable influence from Korea, with sprinkles of Hawaii, Mexico and California. 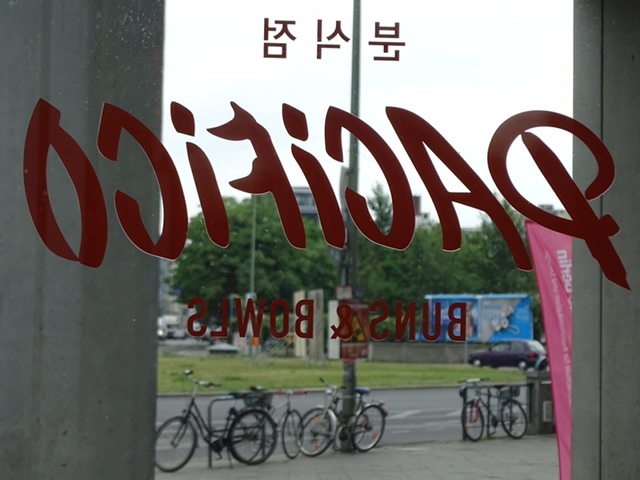 To get to PACIFICO BUNS & BOWLS, just hop on the U-bahn (U8) to Moritzplatz. The restaurant is on Oranienstrasse, across from the amazing Modulor store. 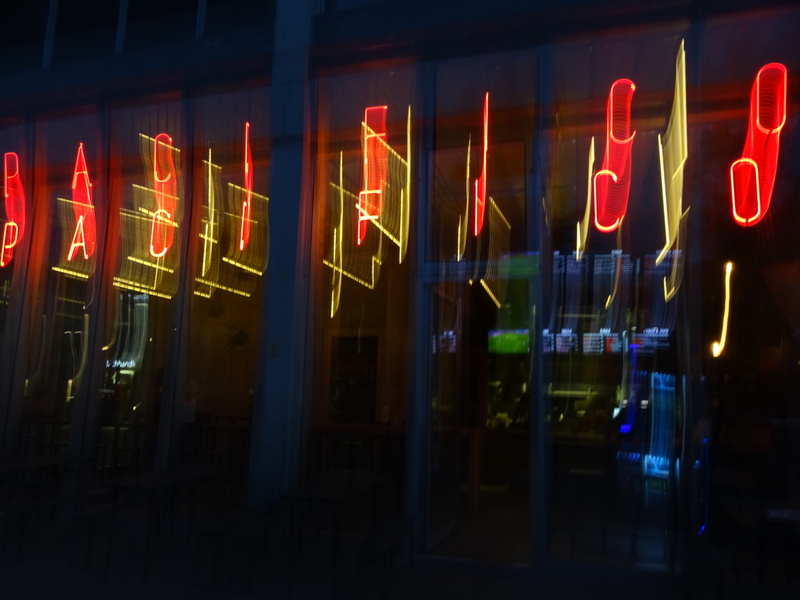 Look for the fun Neon lights and you are sure to easily spot Pacifico. The place has a sleek and funtional design. We are particularly drawn to the artsy light fixture installation. You can’t miss it. Just look up. Also, check out the plants and “vases”. Very cool concept. 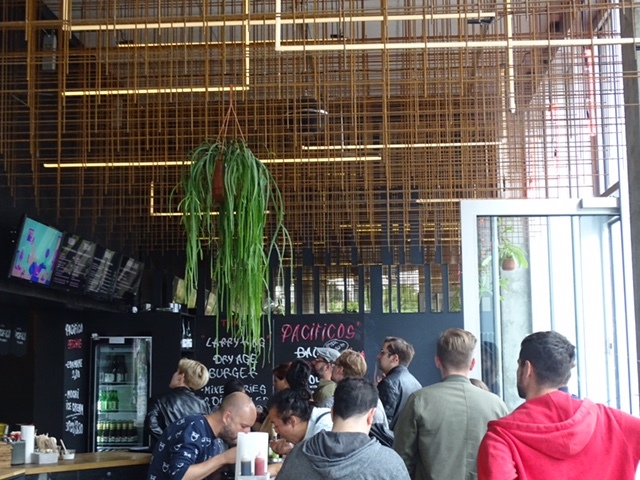 Pacifico does get busy at lunch time, so plan ahead. That said, the good looking staff is very efficient and service is friendly and to the point. Order at the counter. The patrons are mostly young professionals that work in the area and the vibe is super casual and non pretentious. The dishes look scrumptious for the most part and the flavors are rich and satisfying. Options go from fun burgers (try the Kimcheezy, it’s delicious), “tacos” (homemade bao buns served like tacos), scrumptious bowls (the Spicy Kahuna Bowl looked promising) and madus/dumplings. 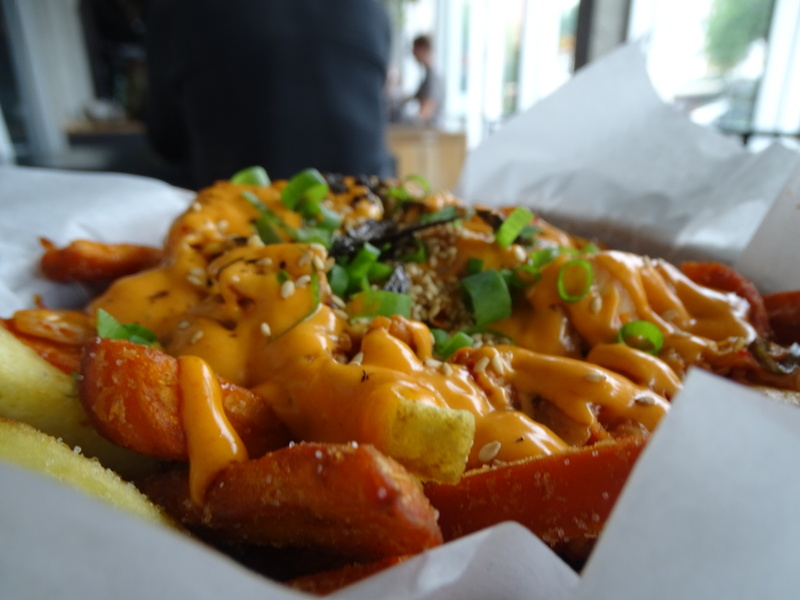 Top it all off with a sloppy side of kimchi fries. You will not regret it. Make sure you have friends along to help you finish it! Even though we classify Pacifico as a lunch place, they do open during dinner hours! Make sure to check their website for specifics! If you are here during the day we recommend you explore Prinzessinengarten (very atmospheric community gardens) right across from Moritzplatz. Take a book to read or just wonder around. It is totally worth a visit. A great community run project that screams “BERLIN”!